The planet Mars or Mangal as this planet is known in Hindi is the planet of war. This red colored planet is said to send strong vibrations relating to energy and courage. Mangal assumes great importance in traditional Indian astrology; particularly that to the matching of horoscopes of the bride and groom. A person is said to be under the influence of Mangal when it is placed in the 1st, 4th, 7th, 8th and 12th house in the horoscope. Numerous kinds of remedies are practiced in India for those under the malefic influence of this planet. This is a Yantra which vibrates to the numerological frequency of Mangal or Mars, The numerological value of this Yantra is the number 21. 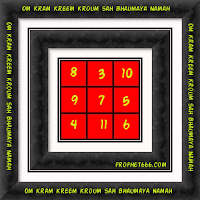 Please give a description how to prepare this yantra (on metal or paper, colour of ink, etc.) and how to use it? I am a Mangalik and need to know this urgently. or can be done on Iron or Steel. Sir please give me any ramedy for hairloss.